A planned overhaul of the Olympic Games is crucial to ensure the world’s biggest multi-sports event’s relevance and continued growth in a rapidly changing world, International Olympic Committee President Thomas Bach said on Sunday. A day before the IOC session votes on the biggest changes for the Olympics in decades, Bach urged members to approve the 40 recommendations dubbed ‘Agenda 2020’, a project he initiated immediately after taking over in Sept. 2013. “In our world -- changing faster than ever -- the success of yesterday means nothing for today,” Bach said at the opening of the IOC session in Monaco. The overhaul, to be voted on Monday and Tuesday, includes changes to the bidding process, making it easier, cheaper and more efficient for cities to launch a bid for the Olympics. The IOC is also planning to bring in more sports, increasing their number past the current 28, to tap into new markets, bigger audiences and as a result higher revenues. Among the first to benefit from a change in the sports programme will be the Tokyo 2020 Olympics, eager to introduce baseball and softball, both hugely popular in the Asian nation. Karate is also an option being considered by the Japanese organisers. The IOC is also planning to set up a digital Olympic channel to keep the Games relevant in non-Olympic years. “If I would deliver this speech in a theatre I would say with an ironic smile: To change or to be changed, that is the question,” said the German. 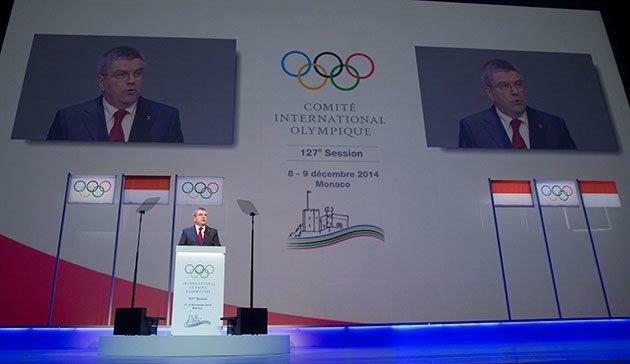 The 127th Session of the IOC officially got under way tonight with an Opening Ceremony at the Grimaldi Forum in Monaco. Speaking at the Ceremony, IOC President Thomas Bach stressed the importance of the 8 and 9 December gathering of the full IOC membership, which will discuss and vote on the 40 recommendations that make up Olympic Agenda 2020, a strategic roadmap for the future of the Olympic Games.